It's been a few months since the two uncles met up for a good meal by ourselves, and my friend decided it was his turn to treat me. Ta Vie 旅 is one of our favorite restaurants as we are both fans of Sato-san, and since it is literally a stone's throw away from my office, it seemed like the perfect lunch venue for me. We decided to take the 5-course short tasting menu, and as it happens, all 5 dishes are familiar to me. Many are among my favorites. And as my friend has been visiting Sato-san with his family since the Tenku RyuGin (天空龍吟) days, he was kind enough to accommodate his cute little daughter - another well-behaved child used to fine dining establishments. Nukazuke (糠漬け) bread - I'm not used to starting with this, but I ain't complainin'! Always love this house made roll. And the house made butter. Caesar salad topped with hotaru squid, hotaru squid Caesar dressing - this has quickly become one of my favorite dishes, on account of the delicious seasonal firefly squids (螢烏賊) from Japan. You've got the usual Romaine lettuce and shaved cheese and croûtons on top. But you've also got the beautiful umami of the squid, along with shredded Japanese spikenard (独活) and pepper chiffonade. The little dab of dressing made with the squid was just awesome. House made pasta with "aonori" sauce topped with premium uni - another one of my favorite dishes. I just looooove the aonori (青海苔)... with all those flavors of the ocean. Then there's the saltwater sea urchin from Yoichi (余市)... which were incredibly sweet as always. "Rock" oyster with pork trotter cassoulet sauce - these big rock oysters (岩牡蠣) from Shimane Prefecture (島根県) are honestly a little too big and fat for my liking, but I can understand how satisfying they can be to some. Not surprisingly I like the cassoulet sauce as it's made with pig trotters, but the sauce was also made with puréed scarlet runner beans (花豆). Sweet corn cold soup, shrimp consommé jelly, basil pesto - this was an extra course from the shorter, 3-course lunch set menu that Sato-san very kindly sent us. How incredibly delightful this was! The amazing, intensely rich and starchy sweetness of Japanese corn just perks me up... and the same botan shrimp (牡丹海老) consommé jelly from Sato-san's signature dish just added some beautiful umami to it all. Of course, the best thing about this dish was that this was chilled - perfect for a hot summer day. Inexplicably, it seems that the local clientele don't like the idea of cold soups... even in this weather. Takano-san told us that everyone else chooses the hot soup option on the lunch set menu. Wagyu "minute" steak with burnt onion and onsen egg, Japanese whisky sauce - another one of Sato-san's classic dishes. Canelés - Sato-san knew how much I love canelés, so he very kindly baked these for us. And they were HUGE! Much bigger than I had expected. They were very crunchy on the exterior, but remained moist in the middle. Absolutely delicious. 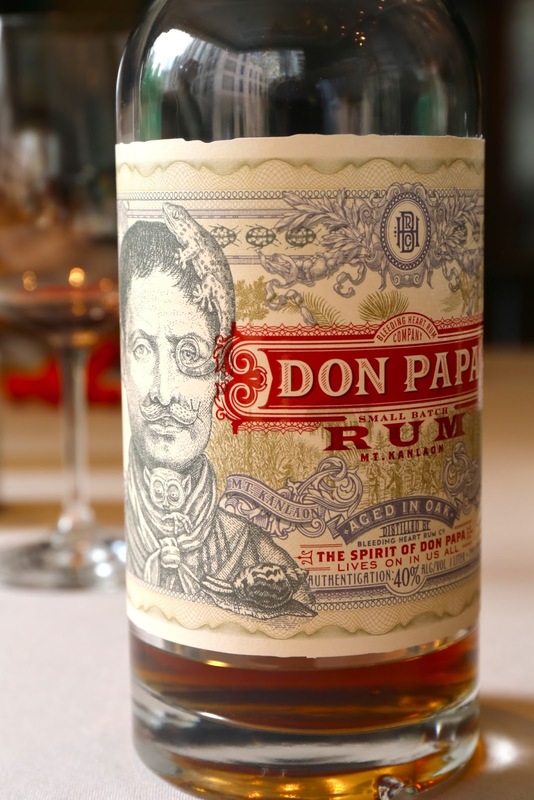 Don Papa rum from the Philippines was added to the batter of the canelé. 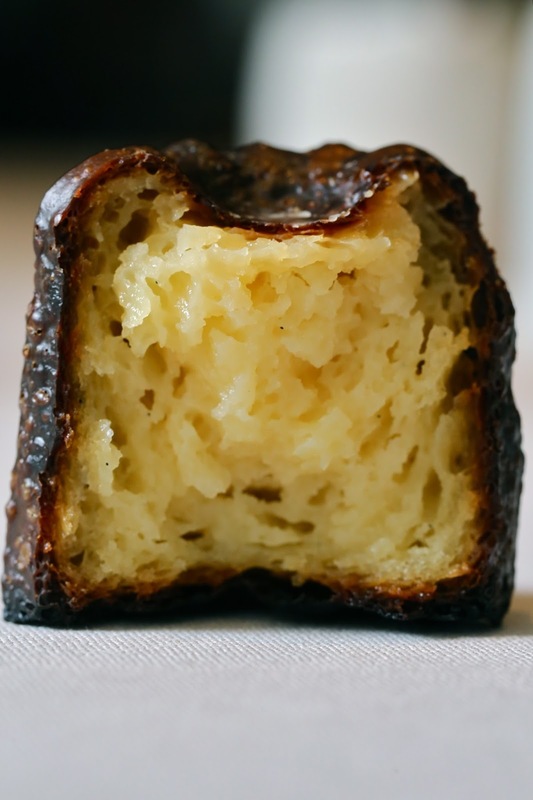 Sumatra tiger coffee - I am ever so grateful that there is now an alternative coffee available, although this smelled (and tasted) a little like me burning my food in the kitchen... Just look at the size of the canelé! I wasn't too surprised that my friend brought wine to lunch, but I didn't want to drink much. And I was really surprised to discover - about an hour after I started drinking it - what a treat this really was. My friend was really, really generous. 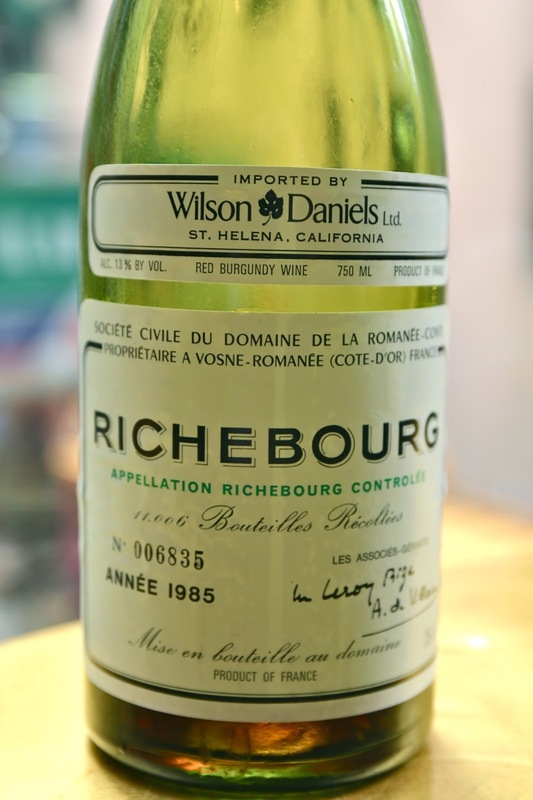 1985 DRC Richebourg - not decanted. Initially very light and acidic on the palate. Opened up with time, and after an hour this became really lovely, with berries, animal, leather, and violet notes. What a really delightful lunch! I am so spoiled... thanks to my generous friends.